From the creator of ‘The Tweenies’ comes the brand –new LIVE children’s stage show, HOW LION BECAME KING OF TINGA TINGA LAND, a fun-packed performance that will transport children and their families on a high-octane adventure to the African Plain as it embarks on a nationwide theatre tour from 14th September. HOW LION BECAME KING OF TINGA TINGA LAND follows the adventures of the wise old bird ‘Banjoko’ as he decides that the land of Tinga Tinga should have a King, and how he sets about finding the suitable Animal worthy to wear the crown. On his journey, Banjoko meets a host of characters, including the Cheeky Monkey ‘Maliki’, a kind but goofy giraffe named ‘Gowon’, a groovy zebra called ‘Zalika’ and a very proud lion called ‘Lutalo’. It’s a historic day in Tinga Tinga Land: the competition to decide which animal will be King. 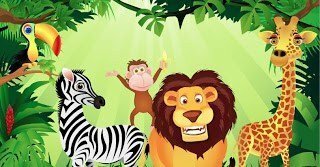 Cheeky Monkey, Kindly Hippo, Wise Bird, Groovy Zebra, and Proud Lion will compete in singing, dancing, storytelling and painting, to see who is worthy to become the next King. Then the King will be crowned, and the party can begin! Mixing classic nursery rhymes with traditional East African tales from the animals of the African Plain, five performers and two drummers lead audiences through a lively journey filled with music, puppets, dancing, and plenty of interaction. The set has been produced utilising the traditional Tanzanian Tinga Tinga painting style and children will be encouraged to turn up in costume, as their favourite animal, to bring a truly authentic African flavour to the performance. Suitable for ages 3+, HOW LION BECAME KING OF TINGA TINGA LAND is touring UK theatres from Friday 14th September until Monday 19th November. I have one family ticket comprising of either: 2 Adults & 2 Children or 1 Adult & 3 Children to a single performance on the UK Tour. To enter simply tell me one of the animals competing to be King. 1. This competition is open to residents of the UK, the Channel Islands, Isle of Man and Republic of Ireland aged 18 years or over, except for those associated with the production company, their families or anyone else associated with this competition. 7. Events may occur that render the competition itself or the awarding of the prizes impossible due to reasons beyond the control of the Promoter, and accordingly, the Promoter may at its absolute discretion vary or amend the promotion and the entrant agrees that no liability shall attach to the Promoter as a result thereof.